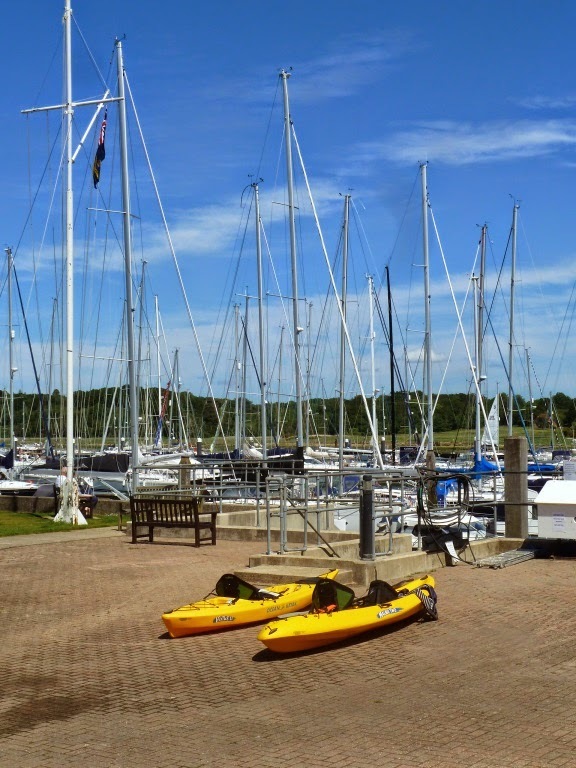 Joseph has been really taken by Kayaking, it might just be because he gets to ride on the two seater and we also bought him a powerful, big capacity water pistol and he takes great delight in soaking whoever is in the single kayak. 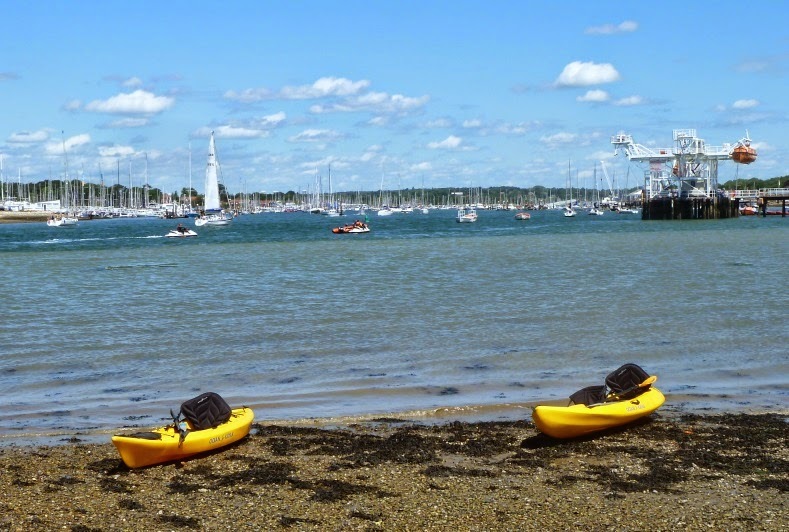 Whatever the reason when it came to choosing what to do on Sunday morning he chose kayaks so we duly launched at the club for a paddle down the Hamble. 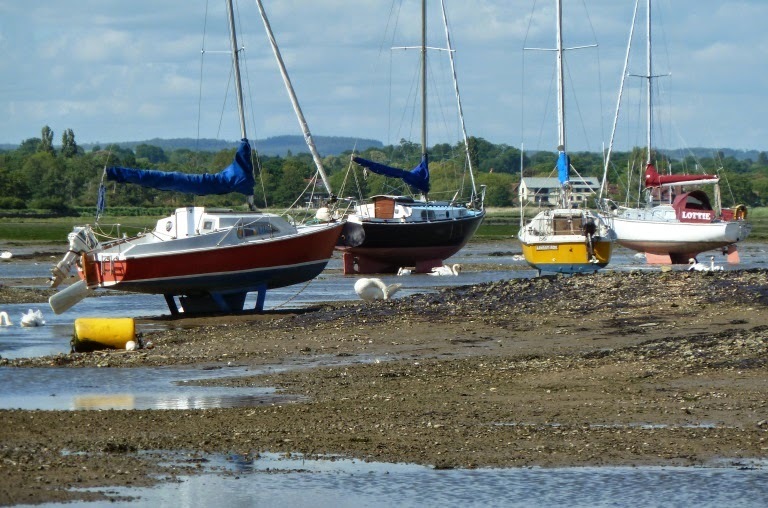 We paddled down to the river entrance on the last of the ebb and went ashore to explore the shingle bank which in normal circumstances we would keep well away from. It was nice to take in the unusual perspective on the Sunday morning Hamble scramble. Later back at the RAFYC the boats were washed off with fresh water and left to dry while we had lunch with friends. 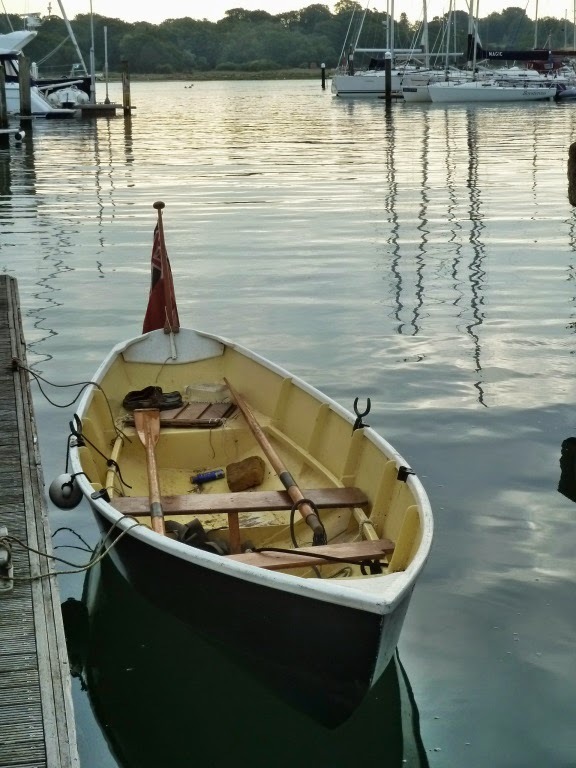 I think it was Phil Bolger the very original American boat designer who said something along the lines that a you can have more fun, more often with a kayak than any other type of boat. I've probably said it before but I don't really understand motorboats and motor boaters and I especially don't get this one, maybe if I was on my way to a fancy dress, aquatic Halloween party and I was dressed as Batman, ok would never happen but you get my point, then again live and let live. On the other hand every now and then one comes along like Gull to change my mind. What a lovely little launch, the only improvement that comes to mind would be a single cylinder steam engine, bacon and eggs frying and kettle on as we wait patiently to raise steam on a bright, clear morning. 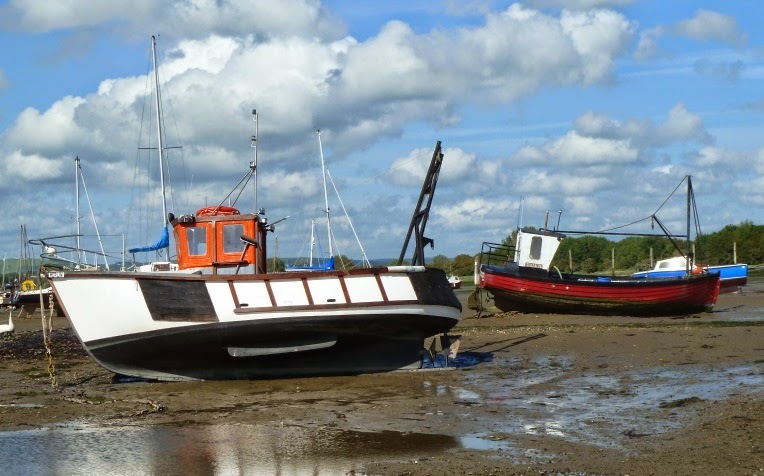 Ok romantic interlude over, but isn't she delightful lovely lines brought to life by the clinker planking, that transom is about as hansom as they come. I'm also especially fond of cream and grey paintwork, it's a combination which is popular in the states and deservedly so. 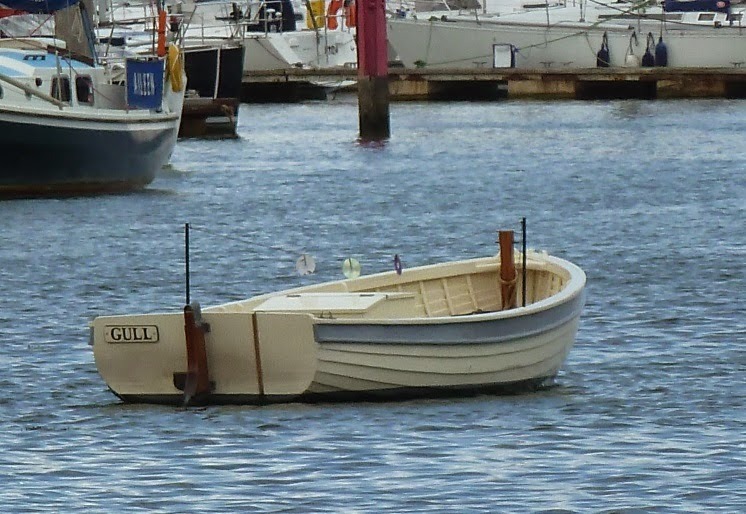 A Marieholm folk boat showing a very attractive transom. 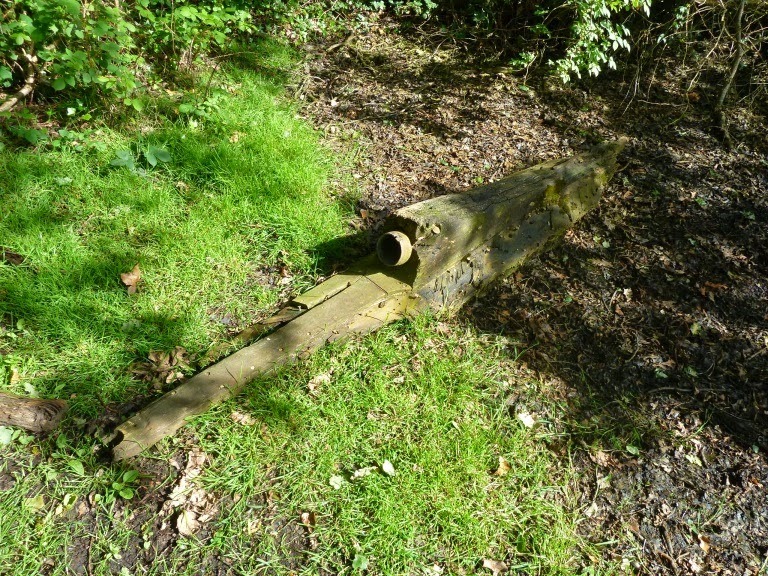 We took a different path walking down to the river recently and spotted this interesting price of wreckage, it's the deadwood, section of keel and stern tube. 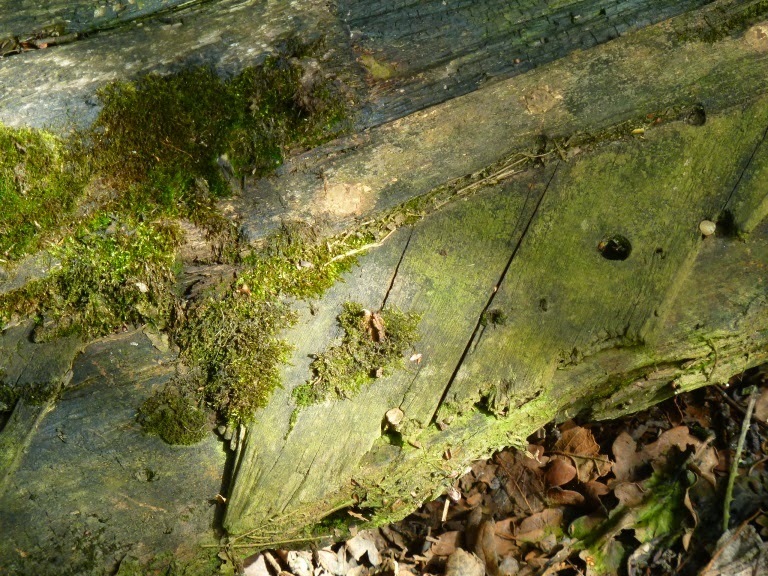 The shaft size is around 3 inches diameter so clearly there was a reasonably powerful engine. Remains of the planking can be seen which was diagonal thin strips laid at about 45 degrees to the keel almost all of that remaining is one layer, but there was evidence of an outer layer oriented in the other direction which had me wondering if maybe this was a wartime motor boat or even a landing craft? 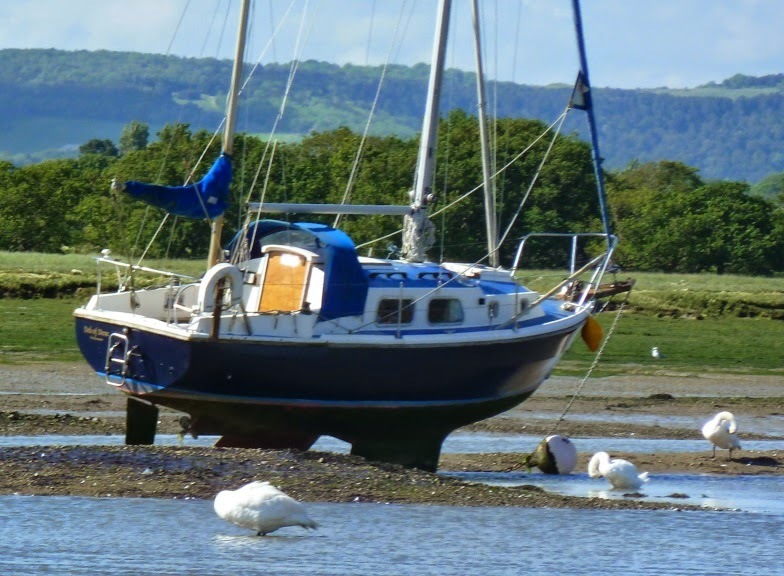 Given its location it may have floated up on the big spring tides we had earlier in the year. 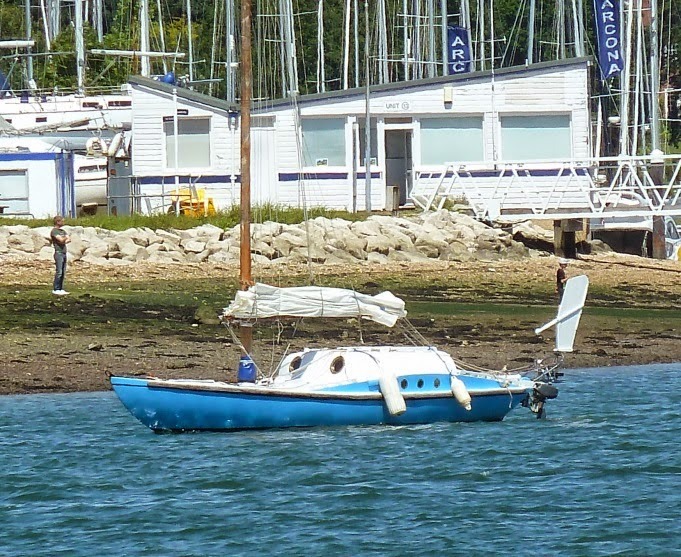 Another example of a modern Nordic Folk Boat, moulded in GRP to simulate clinker construction. 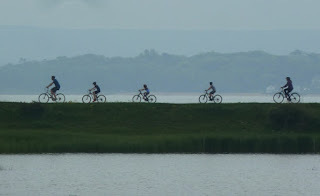 The background spoils the photo and it looks like the waterline could do with a bit of a scrub (note to self!!) 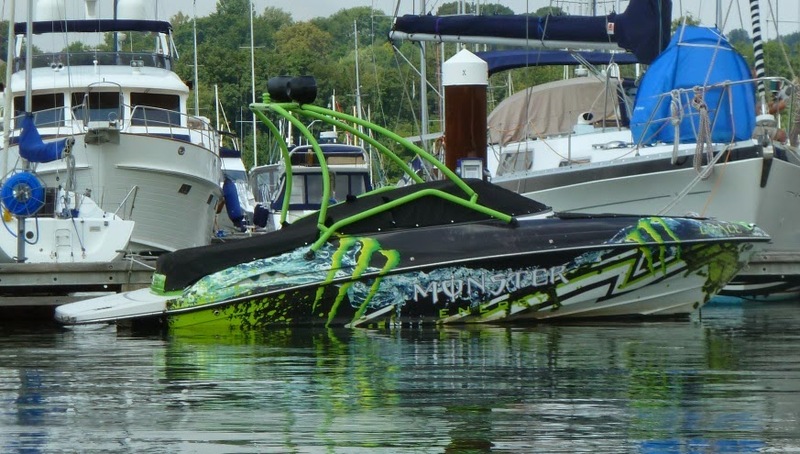 but fine looking boat non the less. 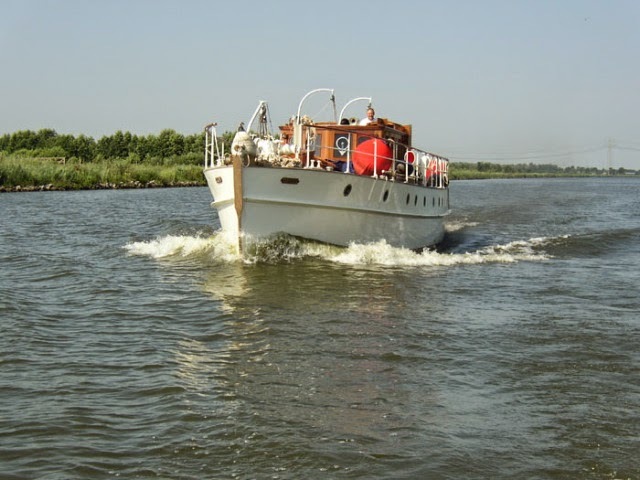 I received an interesting email from Jan Pieter de Graaf who lives in Belgium and owned Orisis the sister ship to motor vessel Vagabond about which I wrote back in December. 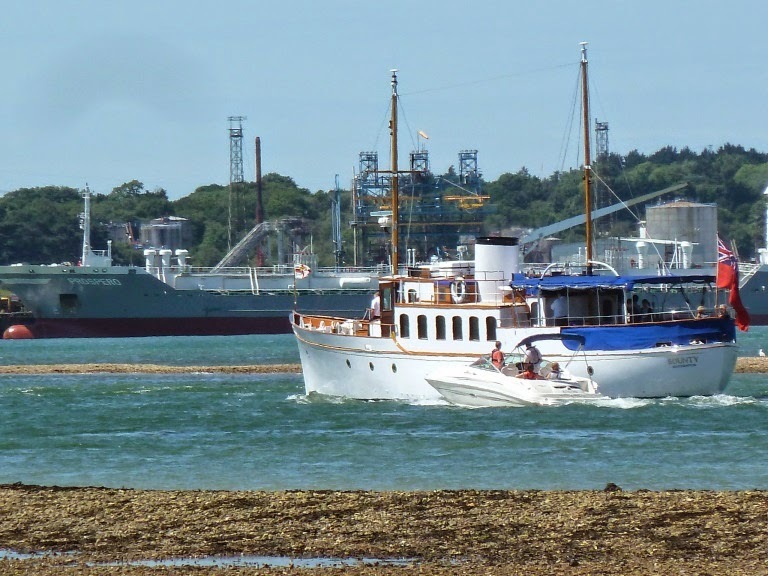 Orisis was built in 1932 by Saunders and Roe in Cowes with Gardner diesels running through Parsons gear boxes. 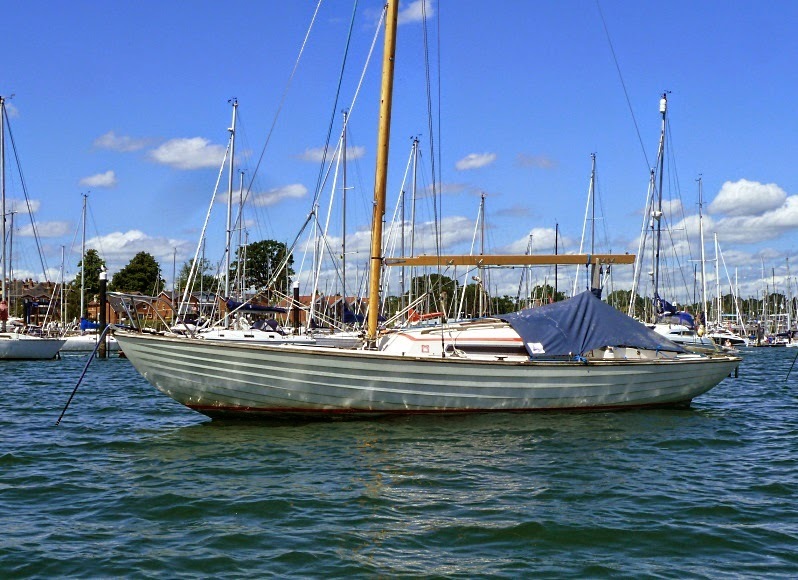 Jan saw Orisis for sale in 1995 and purchased her, but work and other family commitments sadly forced him to sell her. The name is a little strange, I immediately read it as Osiris. From what I can see she was in good hands, Jan Pieter makes amazing and unique architectural cabinets. No Bursledon blog isn't breaking bad, nor have that particular family of mushrooms made an early season appearance. 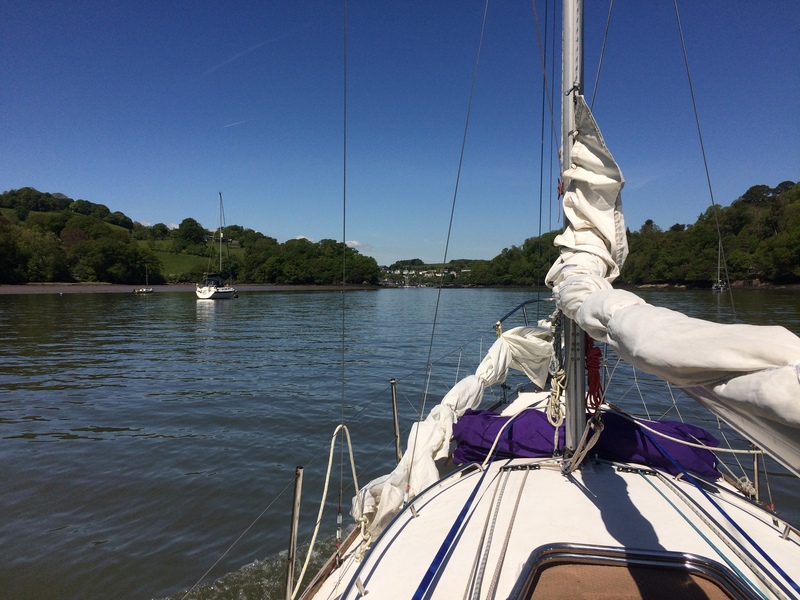 I dried Matilda Emilie out for a scrub and anti foul on a midday low water recently which meant getting up very early to move her off the mooring and down to the scrubbing dock at the yacht club at high water. 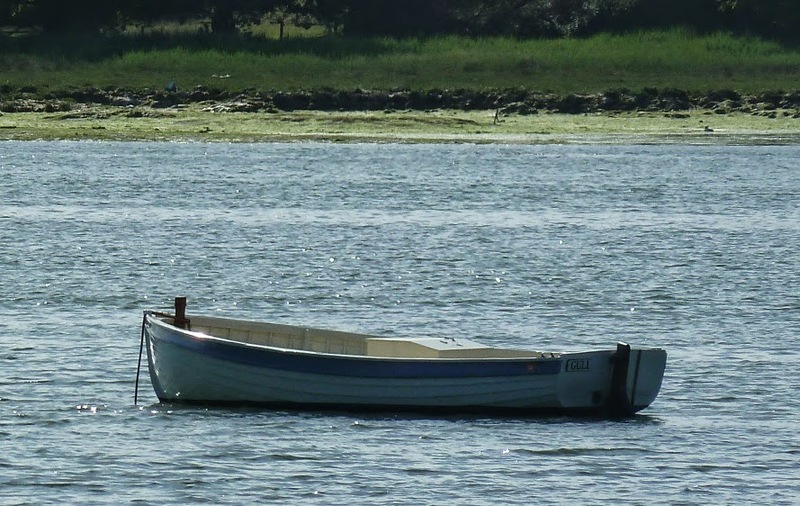 I rowed down river at around 6.00 on a perfect morning, the river was deserted and flat calm under a steely grey sky which soon burned off to reveal a glorious sunny morning, an early morning start on the sort of a day that lifts the spirits and feeds the soul. 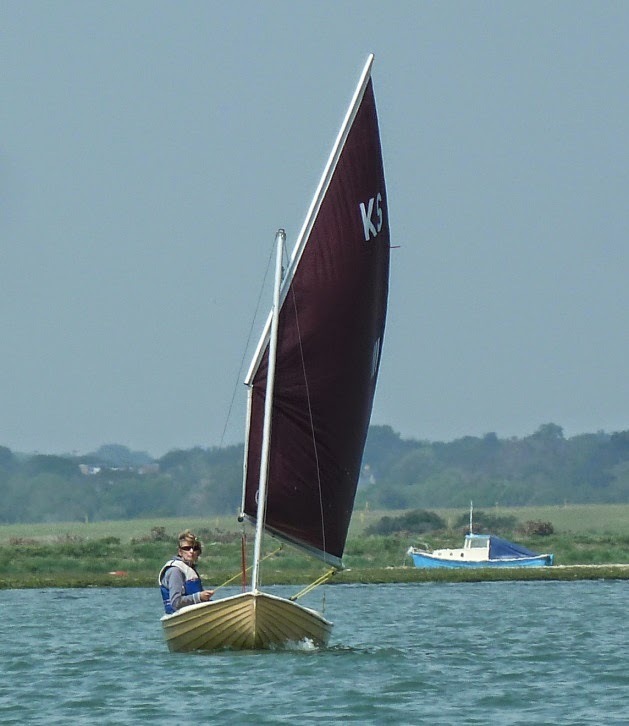 Sister ship to Jester a reworked folkboat sailed byBlondie Haslar, which he developed for single handed sailing. Radical features were the completely enclosed accomodation(slightly reminiscent of a world war two nissan hut) and theChinese Junk Rig. The combination of these two elements allowed the boat to be sailed from the comfort of the cabin and was a major safety feature offshore. Nominations for the New English Dictionary? Now admittedly I work for an organisation renowned for three letter acronyms, where a cupboard is often called a TSU (tall storage Unit – I kid you not) but this really takes the biscuit or should I say baked confectionery tablet? The English language has always been in a state of flux, so I'm slightly worried that maybe I’m struggling to keep up with all this change. 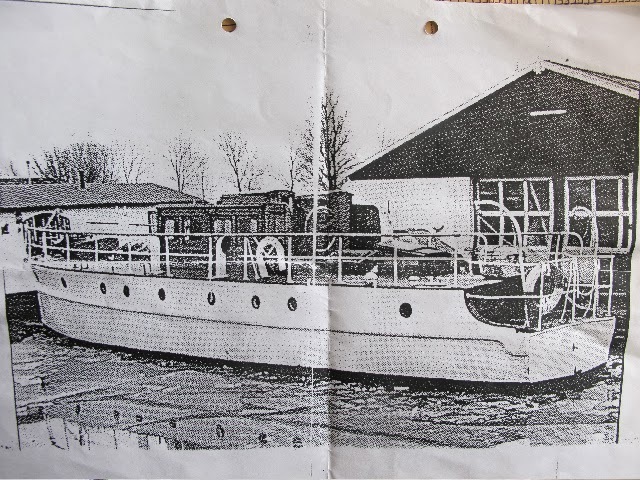 Then again Erica tells me she's given up knitting in favour of fibre craft, and I’m looking at a new boat built with bi-directional organic composite. 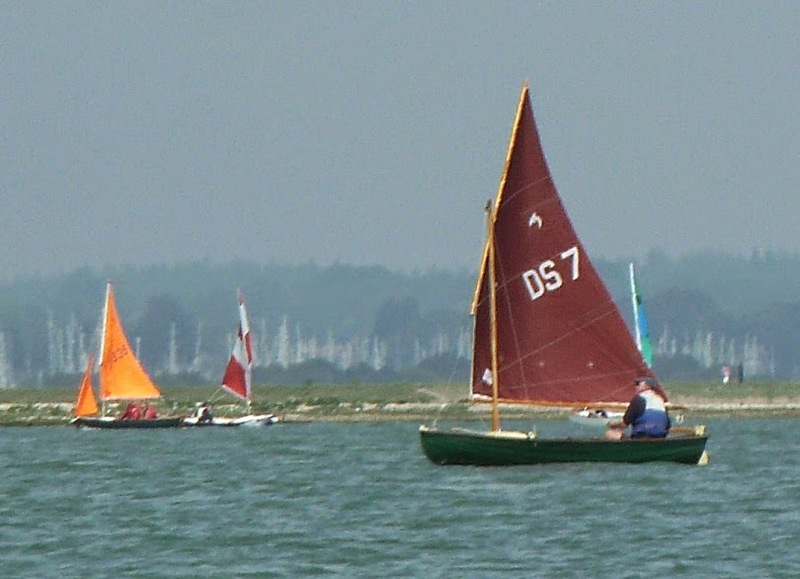 While we paddled out to Hurst Castle on the kayaks recently the Keyhaven SCOWs were racing out in the Solent between North Point and Hawker's Lake. Taking pictures from a Kayak can be a bit of a challenge especially if the camera isn't waterproof, but it was a calm day and I managed to get a few shots. 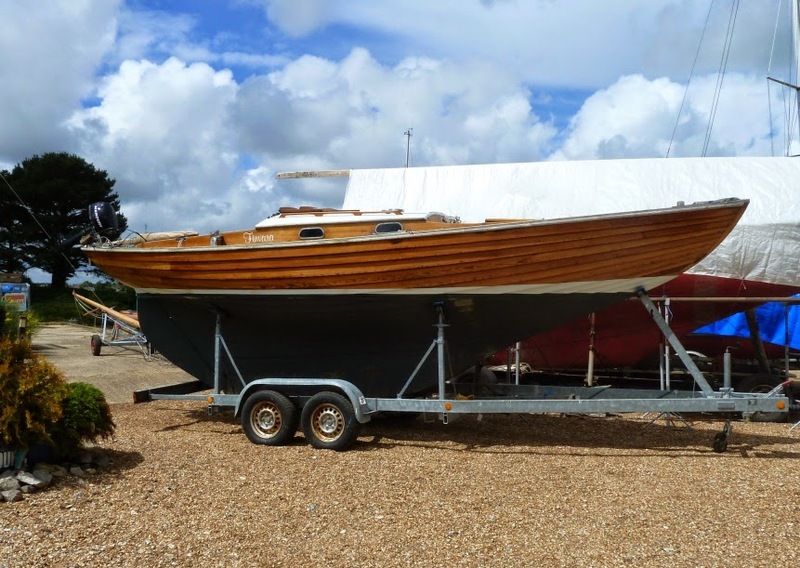 A lovely varnished example out for some work at Emsworth. 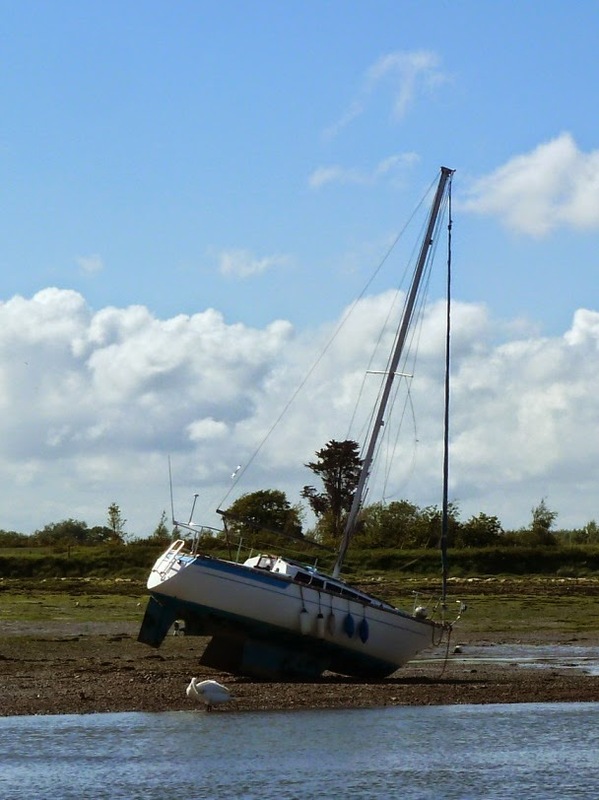 Up the Fishbourne Channel of Chichester Harbour at Dell Quay the midday low water had left the moorings high and dry. 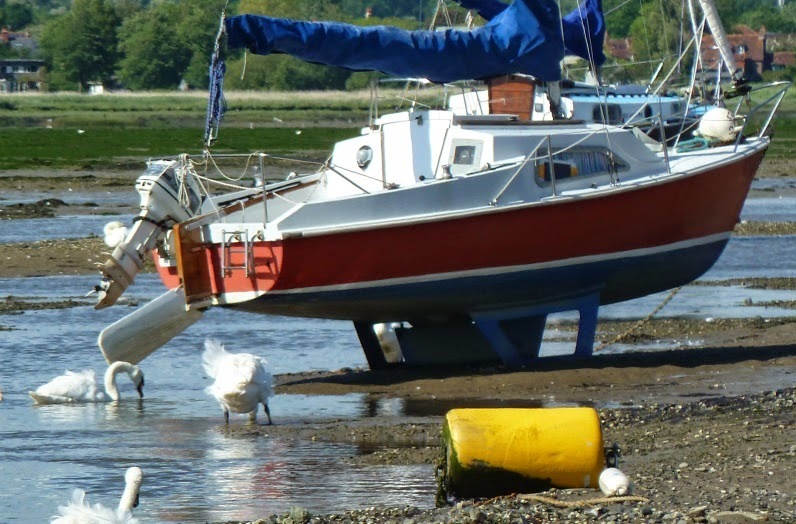 The ground is mostly hard gavel, I say mostly as both Joseph and I managed to get muddy shoes, but for the most part it's easy to walk around and have a look at the stranded boats. 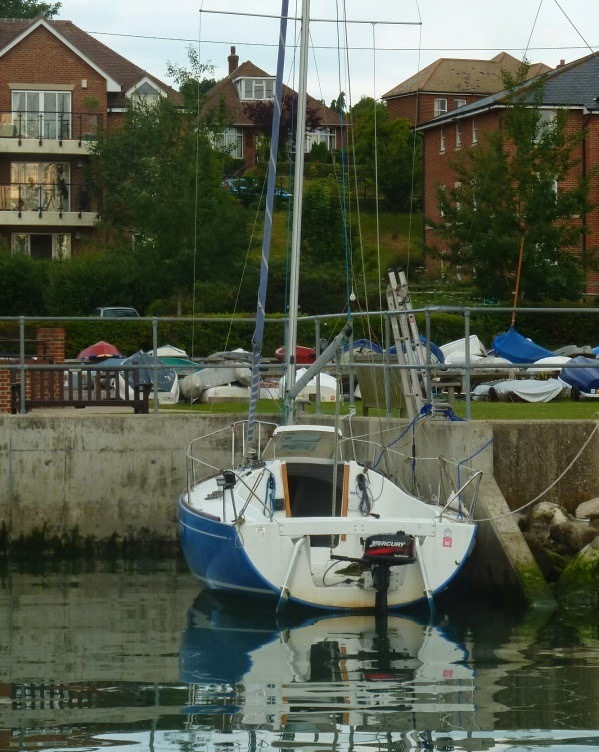 Bilge keelers are great for taking the ground, but it clearly doesn't do to ignore fore and aft weight distribution. 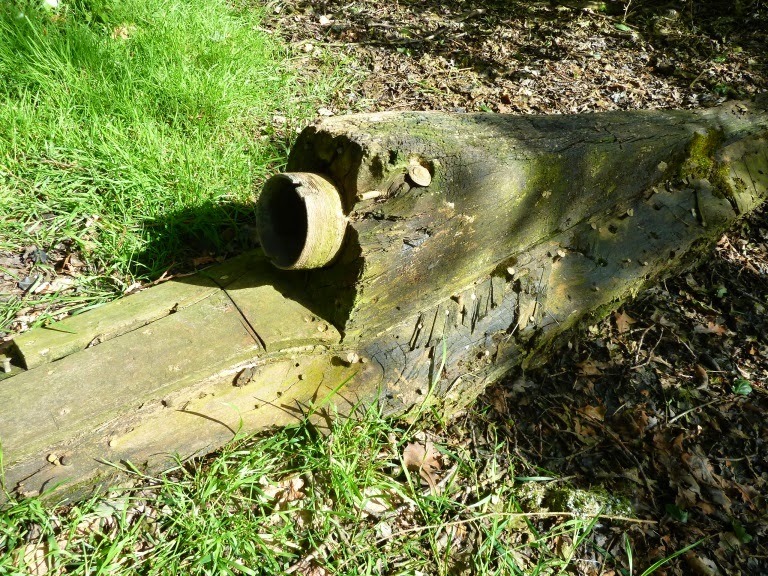 Despite the uneven ground this one seems to settle nicely and would make for a better nights sleep if staying on board. I can imagine watching the sun go down surrounded by the local wildlife. 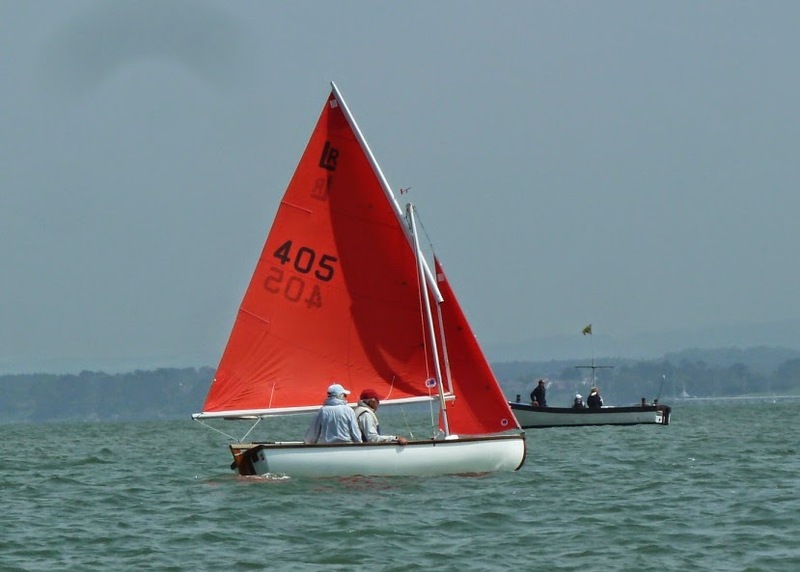 Interesting keel configuration on this red sloop, it looks like a centre drop keel has been upgraded with a pair of open bilge keels, while they probably don't add much to sailing performance I wonder if solid ones might have been better for water flow? 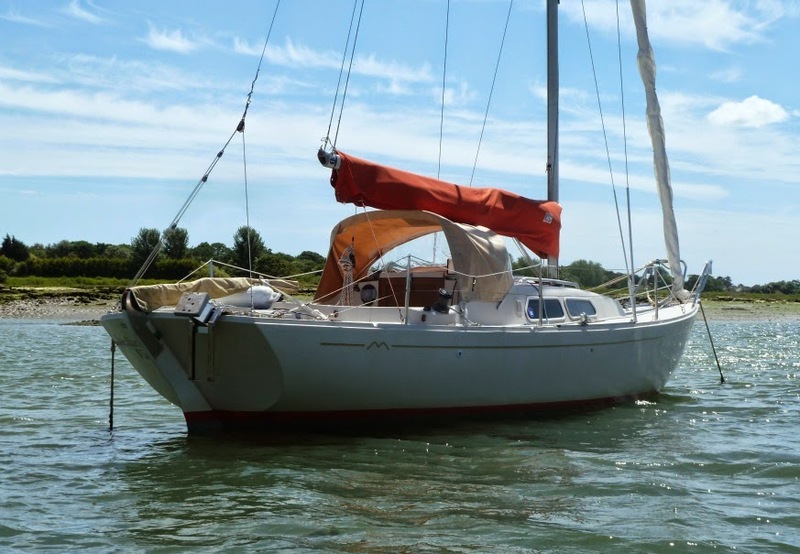 But hey a practical little yacht.